Per aprire le istruzioni di ordinazione compresse è necessario aver installato Adobe Acrobat Reader. What is the Feature of the Week? The Feature of the Week is an item that is available for a special price, or another promotion that the company is sharing with you. There are two areas where a Feature of the Week may appear: on the Home Page and on the Catalog page and changes regularly. If you are a registered user, this promotion may be targeted to you. Just click on the link to add the item to your Shopping Cart. Note: If you have an account, make sure you log on before you start browsing our catalog. Registered users have access to special prices and also may choose from a larger product line. What is a SKU number? A SKU Number is a Stock Keeping Unit. This is the unique number that identifies every product in the catalog. Each item has a unique SKU number. 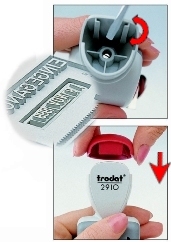 For instance a stamp with a red handle will have a different SKU number from one with a blue handle. Some items have two SKU numbers. How do I select and buy products online? Drilling down through the catalog by choosing items from the illustrated categories on the Category page, and adding a product through the â€˜orderâ€™ buttons. Select a product and then hit either the â€˜directly to basketâ€™ or the â€˜orderâ€™ button wherever it appears on the site. Note: Customizable products cannot be added directly to the Shopping Cart. If you select a customizable product, the site will take you to the Custom Wizard where you can design and preview it before ordering. We are not responsible for orders that are unsatisfactory due to information you have entered incorrectly. Proceed through the Shopping Cart as directed. Click on the â€˜stampsâ€™ button in the â€˜set your layoutâ€™ area. Select a product and then hit the â€˜orderâ€™ button wherever it appears on the site. Hit the â€˜direct to basketâ€™ link or the â€˜orderâ€™ button. If you know the SKU number of the product you want to order, you can enter it at the bottom of the Home page or Shopping Cart page in the Order By SKU area. Enter the SKU # and hit â€˜orderâ€™. You will then proceed to the Shopping Cart, where you can add more products using this functionality displayed at the bottom of this page. How do I change the quantity of items in my order? On the Shopping Cart page, you can change the quantity of items in your order or delete an item. After making your changes, hit â€˜Update Cartâ€™ to see your revised total (remember that tax, shipping and handling have not yet been added). If I delete an item from my order, how can I display the revised total? You can delete an item from the Shopping Cart by clicking on the â€˜deleteâ€™ link beside the quantity. After making your changes, hit â€˜Update Cartâ€™ to see your revised total (remember that tax, shipping and handling have not yet been added). Why does my total not include tax or shipping and handling charges? Your tax and shipping and handling charges can only be added once you have entered in your account and shipping details for this order. These pages are displayed when you click â€˜confirm and submit orderâ€™ on the Shopping Cart page. How do I return to the Shopping Cart page? You can return to this page by hitting the Cart button in the top navigation bar, or on links on other pages, as appropriate. How do I add more items once I have added an item to the Shopping Cart? When you are on the Shopping Cart page, you can continue shopping by clicking the Continue Shopping button. This will take you to the top level of the catalog. Each time you click an â€˜orderâ€™ button, you will be taken to the Shopping Cart page and the items will be saved. Will items be saved in the Shopping Cart if I decide not to buy today? The Shopping Cart is cleared every three weeks. Your potential orders will remain in the Cart until this time. What kind of security do you provide for online orders? For more details on Secure Sockets Layer technology, please see the http//:www.netscape.com (Netscape Home Page). We will also send e-mail confirmations when you place your order and also when we ship your order to you. These messages do more than just help you track your order. They can also alert you to any unauthorized activity relating to your account that has been performed on your computer. If you receive an e-mail confirmation for an order you did not place, please let us know immediately at [**customer service e-mail**]. How can I find out if I am eligible for a discount and what the amount will be? If you are eligible for a discount you will be shown this on the product description page (the page which describes the product in detail). You will also be shown discounts that apply to an item on the Shopping Cart page. If you aren't completely satisfied with the quality of the products you receive, we will replace them for free within 30 days of the date we receive your order. Just return the order via UPS or Insured Parcel Post to [address here] and enclose a note stating what's wrong. We'll correct the error and send you a replacement in no time. Please note: We are not responsible for orders that are unsatisfactory due to information you have entered incorrectly. We always welcome feedback from our customers, even when itâ€™s not positive. If you disagree with our policy, please drop us an e-mail at **Customer_Serviceemail** and tell us why. Customizable products cannot be added directly to the Shopping Cart. If you select a customizable product, the site will take you to the Custom Wizard where you can design and preview it before ordering. 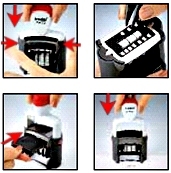 Easy replacement of the inkpad and adjustment of the current date . 2. Adjust the date to the precise height of the text plate.